Now that prerelease for Core 2019 is done....what's next? Here's a quick look at the week following, along with our schedule for Core 2019's Draft Weekend and Sealed League. Come draft Dominaria with us one last time, or bring your favorite Modern deck and sling some cardboard. Prizes for Modern will be store credit for the top 4-8 players based on attendance, and prizes for the booster draft will be pack per win, with a bonus 2 packs for going 3-0 (for a total of 5 prize packs for 3-0). 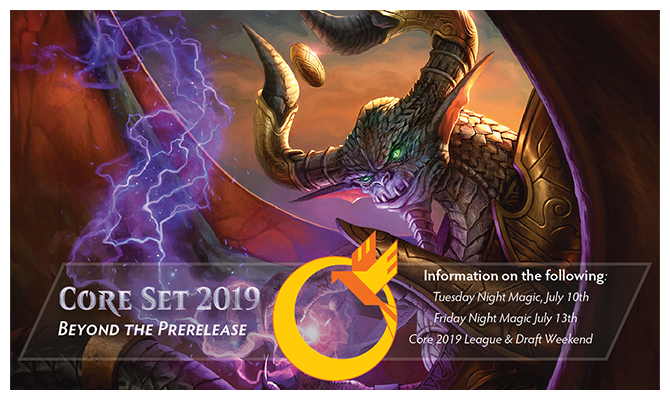 Come Friday Core 2019 will be legal in the Standard format, which makes it the perfect time to try out all those new cards you got at the prerelease (or from one of those boxes you picked up over the weekend). An entry fee of $5 covers up to 4 rounds of pack-per-win play. Both FNM events will feature the new line-up of promos including Murder, Militia Bugler, and Elvish Rejuvenator. Really like drafting? I mean reeeeaaaallly like drafting? We've got 3 more drafts lined up this Saturday and Sunday. Cause it's release weekend, each event will have a cap (see below). Show up early to make sure we have spot for you! Entry fee for each of these will be $15, prizes will be the same as the previous night's FNM (pack-per-win with a single bonus pack for 3-0's). 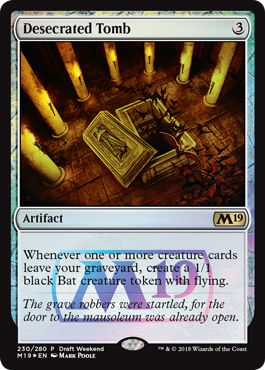 They'll also come with a participation promo while supplies last of one Desecrated Tomb! Each reported win earns you 4 points. A loss earns 2 points, and a draw earns 3. You can also earn extra attendance points for showing up to the Queer Geek League Days each Sunday with an additional point for attending 4 or more events, up to a max of 5 extra points. League prizes will be computed and available for pickup approximately 1 week after the league ends. See a store employee to pick up your prizes. 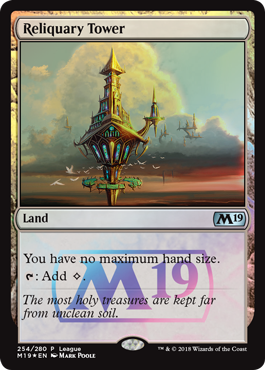 Additionally, all attendees will receive a free foil Reliquary Tower while supplies last!